I hope you all are having an amazing spring! I don’t know about you, but I am ready for summer. I’m ready for the beach and swimming. I’m ready for shorts, tank tops and cute totes! Speaking of totes, I have created a super simple and colorful tote pattern. My Asbury Tote is an easy pattern that crochets up super fast. It uses Bernat Maker Home Dec yarn. This is the same yarn I used for my Mochila Bag pattern. This yarn is one of my absolute favorite yarns to work with! The blend of cotton and nylon make this yarn so soft, yet very durable. I actually just found out that Bernat has come out with a Maker Outdoor Stripes yarn as well! I can’t wait to try that too! This tote pattern is made by first crocheting the base, then crocheting in the round for the body of the bag. I also added grommets to the bag. This was my first time using grommets and I have to say, it is super easy! I have included a link below to a video tutorial that takes you step by step on how to use the exact grommets I used for this tote. I then used twisted cord that I found at Joann’s for the handles! 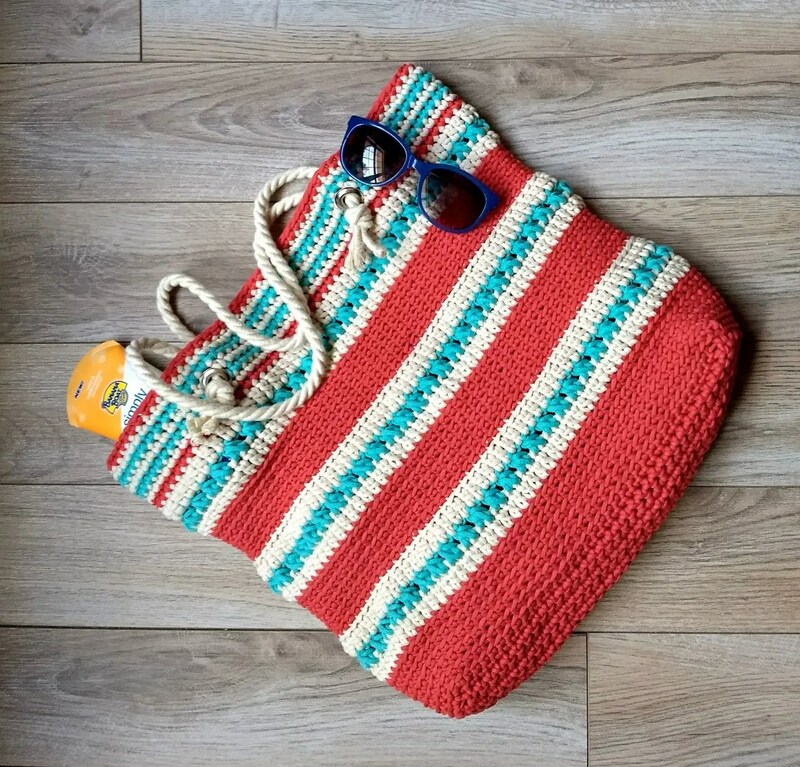 I chose to use three different colors for this tote but it can certainly be crocheted using only one color as well! Scroll down for the pattern! If you would like to purchase an ad-free printer friendly version of this pattern, click HERE. Bernat Maker Home Dec yarn in the colors Woodbury, Cream and Aqua. You will need a little more than half a skein in Woodbury, about 1/4 skein in Cream, and a little less than 1/4 skein in Aqua. A yard and a half of 3/8″ twisted cord for the handles. I bought mine at Joann’s but you can buy it at Walmart or on Amazon. You will be working in the round for the body. The rest of the pattern is crocheted in the round with only the sc stitch. Lay your tote flat upside down so the opening is facing you. On the second Aqua round, count 13 stitches in on each side. You will place your grommets between the 13th and 14 sc stitch on each side. Follow the video HERE for directions on how to add the grommets (eyelets). Start the video at the 19:12 mark. I chose to use a twisted cord for my handles. It is nice and sturdy making it perfect for tote handles! I found mine at Joann’s. Unfortunately, the color I chose you can only get in store. You can essentially use any rope/cord you like. Joann’s has a lot to choose from! You can also purchase a similar rope at any Walmart. I had a yard and a half of the cord cut in store. This made for the perfect length. Cut the cord in half. Then place one end of one of the pieces of cord through the grommet from inside to outside of the tote. Make a knot to secure. Do the same for the other side. Turn your tote around and do the same with the other piece of cord. I really hope you have enjoyed this pattern! Make sure to find me on Instagram and Facebook!